The body is mainly composed of water molecules which each contain two hydrogen nuclei or protons. When a person goes inside the powerful magnetic field of the scanner these protons align with the direction of the field. A second radio frequency electromagnetic field is then briefly turned on causing the protons to absorb some of its energy. When this field is turned off the protons release this energy at a radio frequency which can be detected by the scanner. The position of protons in the body can be determined by applying additional magnetic fields during the scan which allows an image of the body to be built up. These are created by turning gradients coils on and off which creates the knocking sounds heard during an MR scan. Contrast agents may be injected intravenously to enhance the appearance of blood vessels, tumors or inflammation. Contrast agents may also be directly injected into a joint, in the case of arthrograms, MR images of joints. Unlike CT scanning MRI uses no ionizing radiation and is generally a very safe procedure. The typical MRI examination consists of 5-20 sequences, each of which is chosen to provide a particular type of information about the subject tissues. This information is then synthesized by the interpreting physician. 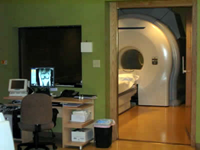 Functional MRI or functional Magnetic Resonance Imaging (fMRI) is a type of specialized MRI scan. It measures the hemodynamic response related to neural activity in the brain or spinal cord of humans or other animals. It is one of the most recently developed forms of neuro imaging. Since the early 1990s, fMRI has come to dominate the brain mapping field due to its low invasiveness, lack of radiation exposure, and relatively wide availability.